Cooking on Skates: Cake Balls—on Skates! My hubby went to a Super Bowl party without me. I was going to go for the commercials and performances, but went out of town for work/friends instead. (Hi, friend! I know you read this!) I don't know if it was laziness on his part of what, but hubby asked me to make him cake balls to take to the party. He probably knew that all his friends would love him more for cake balls. He was right. So how does one make balls? Fortunately, you do not have to bake cake in ball-form. Whew! First, go to Bakerella and envy her amazing cake balls. If you're like me, yours will never be as pretty as hers. You'll always feel inadequate in this area. But deliciously inadequate. Start off by making a boxed cake. Any kind will do! 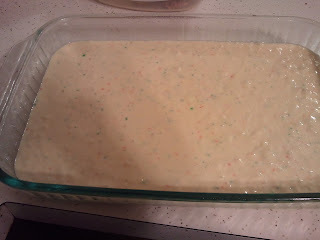 My hubby likes funfetti cake, so I used that here. I prefer white cakes to chocolate or fruity, so I actually think it's delicious like this. After it's baked fully, let it cool on the counter for an hour or so. Then break it up into a bowl. Mix the crumbs with a fork until you have cake-crumb-meal. 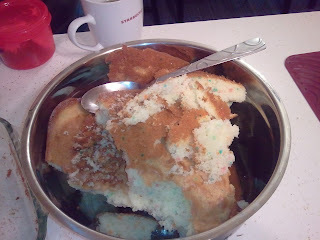 Then mix in a can of whatever frosting you want. Be creative! Or not! I used whipped buttercream frosting, but only because I couldn't find a non-whipped version. What's with everyone and whipped frostings? I prefer smaller amounts of the real stuff. And keep your Diet Dr. Pepper back on the counter far enough that you don't knock it over. Miraculously, I didn't. Ooh, and wear your skates. Then you're cooking! On skates! Yes, cooking on skates! I don't normally do this, but now I want to do it more often, as long as there's no fire involved. Otherwise I'd skate into fire and burn myself. Not good. Keep making balls until you're completely sick of this. It took me about 20 minutes to do all of them, I'd guess. You can chill the mix a little before you start, but it's not necessary. It's strangely similar to making meatballs, except less disgusting. I'm delicious! After you've made all your balls, put them in the fridge to cool for 30 minutes or more. Then heat up some candy melts or almond bark in the microwave. Probably you should use a double boiler, but I never have in my life. I may die of microwave radiation someday. Also, don't use food coloring in your coating! It'll turn all weird. If you want colored coating, you'll have to go to a hobby store and buy colored candy melts. I never do. The laziness thing. Once you have cold balls and melted coating, dip them however you like. I usually use a small spoon. DeVeeM had good luck with chopsticks. Put your coated balls (I'm having too much fun with this) in a clean pan of some sort. They'll harden after a bit. Ta-da, cake balls! I didn't decorate this any further, but there's a lot of room for prettiness. And I ran out of coating, so we had a few uncoated balls. They were still delicious. (Giggle.) I'm also convinced that they taste better after sitting in the fridge for a day because the cake fully soaks up the frosting and melds in a perfect way. Thanks! Candy melts are kind of like little pieces of almond bark. You can buy them at a craft store like Hobby Lobby, JoAnn, etc.